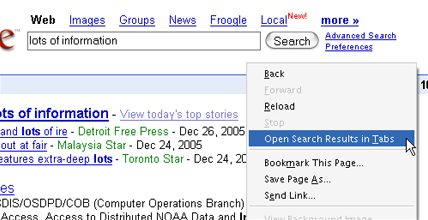 GoogleTabs was an extension for Mozilla-based Web browsers that opened Google search results in tabs via an option in the context menu. The last version of GoogleTabs was version 2.3. This version had support for all of the major Google searches: Web, News, Image, Groups, Local, Scholar, and Froogle. It also supported opening all of the News main page stories in tabs and all of the topics of a group in tabs. GoogleTabs is no longer available for installation, but you can download the source of the last version for reference purposes. My extension Links Like This is an attempt at generalizing GoogleTabs for all webpages. Note: even if you package this code into an extension, it will not work with the latest Google search pages, as they’ve modified their HTML since the 2.3 release. i use these extension very comfortable and many thx. I was going to recommend this to people and wondered why it didn’t show up in any search of Firefox’ Add-Ons lists – I had to do a search in my own Bookmarks, which led me to this site. I still have “Open Search Results in Tabs” in my right-click context menu, and was wondering why this hadn’t been working recently. I’ve just updated my Firefox and it didn’t tell me that this Add-On was no longer compatible. I thought it must be conflicting with other extensions I’ve recently downloaded, so I disabled the most recent ones. “Open Search Results In Tabs” still didn’t work. I re-enable the most recent extensions and disabled the not quite so recent ones, and now this Add-On works fine again! I don’t see why Google would want to disable this useful search aid – It speeds up some kinds of search in Google. Perhaps Google have modified their HTML to allow this extension to work once again. Or will it still work but only in certain contexts? Whatever google did, they must have changed it again, because this extension still works perfectly for me as of 11-28-07. It did stop working for about a week, but now everything works again. You may want to check it out for yourself though. That being said, for me this is a very important extension and it’ll be sad to see it discontinued. It’s something that I’d like to see made a default part of the firefox charm. I hope that you reconsider. It’s still working for me too! I can’t remember what I did before this extension and I really wish you would continue it! I love this extention. But there is a huge bug. It can’t do opening the results from scholar.google.com! Would it be possible to intgrate that?